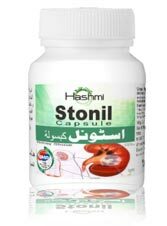 Stonil Capsule is the best treatment for kidney stones. This product is an herbal product and the knowledge of Ayurveda is behind the formation of this product. If Vata, pitta, and Kapha is balanced in our body then the stage is known as “Disease free stage”. Stonil Capsule is formed to maintain a balance of these energies in our body. The imbalance level of these 3 energies is responsible for the formation of Kidney Stones. The chemicals that are present in the urine are responsible for the formation of stone. Its size can be very tiny or can similar to a ball. It gives rise to various pains inside the body including abdomen and back pain. This herbal capsule will help you in breaking the stone into very tiny particles. These tiny particles will be thrown outside the body in the form of urine. You will get relief in the pain and also get rid of kidney stones. This herbal capsule provides the natural treatment for kidney stone. This product is made by natural herbs. There is no side effect of this product on your body. Chemical products can cause problems, but the herbal products are safe. Take 1 capsule in the morning and 1 capsule in the evening for fast results. Drink more water daily. Symptoms may be seen after the stone passes to the ureter. If the stone is small in size, you will no experience any kind of symptom. It may raise pain in the back, abdomen. Sometimes it is responsible for groin and genital pains also. Calcium stones are formed by calcium phosphate and oxalate in the body. It is the stage when the body fails to absorb the calcium from the food. Stone formation due to the composition of uric acid in the body is known as uric acid stone. The stone occurs with the kidney or urinary infection is known as “struvite stone”. Stones formed due to cystine chemicals known as “Cystine stones”. Too much cystine in the urine is responsible for the creation of cystine stone. Gout :- When a uric acid increase in blood and urine, this condition is known as Gout. It is responsible for the formation of uric acid stones. Hypercalciuria :- When calcium from food is excreted into the urine, the condition is known as hypercalciuria. IT forms calcium phosphate stones. Hypertension and diabetes :- These diseases are also responsible for the formation of stones. Dehydration :- It is responsible in 60% cases of diabetes. Low intake of fluid leads to dehydration.